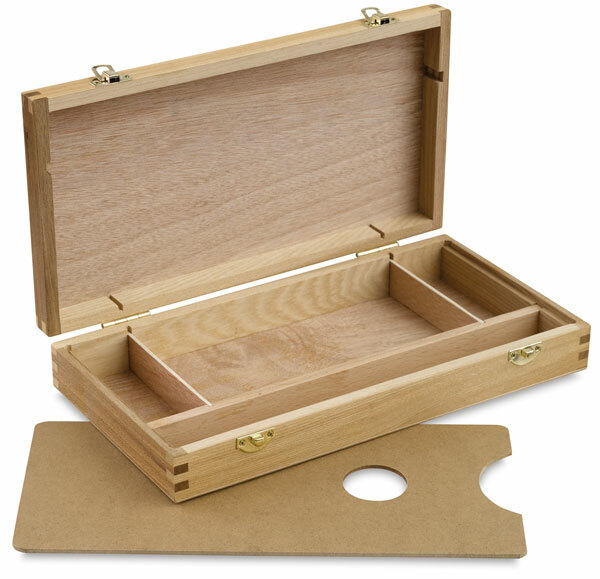 This high-quality, hand-sanded hardwood Sketch Box is ideal for plein air artists, students, crafters, or anyone who wants a great way to protect, transport, and store their art supplies. The interior is divided into four compartments — two small, one large, and one long. They're perfect for organizing pens, pencils, charcoal, blending tools, inks, small accessories, and more. An artist's palette is also included that fits securely over the interior compartments. Crafted of sturdy elm with finger-joint construction, the Sketch Box is finished with sturdy brass hinges and latches. The Sketch Box measures 2-1/8"H × 12-1/2"W × 6-1/2"D. The palette measures 11-1/2"W × 5-1/2"D.